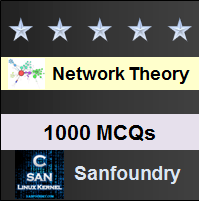 This set of Network Theory Multiple Choice Questions & Answers (MCQs) focuses on “Transfer Function”. 1. The transfer function of a system having the input as X(s) and output as Y(s) is? Explanation: The transfer function is defined as the s-domain ratio of the laplace transfrom of the output to the laplace transfrom of the input. The transfer function of a system having the input as X(s) and output as Y(s) is H (s) = Y(s)/X(s). 2. In the circuit shown below, if current is defined as the response signal of the circuit, then determine the transfer function. Explanation: If the current is defined as the response signal of the circuit, then the transfer function H (s) = I/V = 1/(R+sL+1/sC) = sC/(s2Lc+RCs+1) where I corresponds to the output Y(s) and V corresponds to the input X(s). 3. In the circuit shown in question 2, if voltage across the capacitor is defined as the output signal of the circuit, then the transfer function is? Explanation: If the voltage across the capacitor is defined as the output signal of the circuit, the transfer function is H(s) = Vo/V = (1/sC)/(R+sL+1/sC)=1/(S2LC+RCS+1). 4. Let us assume x (t) = A cos(ωt + φ), then the Laplace transform of x (t) is? Explanation: We use the transfer function to relate the study state response to the excitation source. And we had assumed that x (t) = A cos(ωt + φ). On expanding and taking the laplace transform we get X(s) = AcosØs/(s2+ω2 )-AsinØs/(s2+ω2) = A(Scos Ø-ω sinØ)/(S2+ω2 ). 5. The s-domain expression for the response for the input mentioned in question 4 is? Explanation: We had the equation Y(s) = H(s)X(s) to find the steady state solution of y(t). The s-domain expression for the response for the input is Y(s)=H(s) A(Scos Ø-ω sinØ)/(S2+ω2 ). 6. On taking the partial fractions for the response in the question 4, we get? Explanation: By taking partial fractions, Y(s)=k1/(s-jω)+(k1‘)/(s+jω)+Σterms generated by the poles of H(s). The first two terms result from the complex conjugate poles of the deriving source. 7. The value of k1 in the question 6 is? Explanation: The first two terms on the right hand side of Y(s) determine the steady state response. k1=H(s) (A(scosØ-ωsin⁡Ø))/( s+jω)|s=jω = 1/2 H(jω)Ae-jØ. 8. The relation between H (jω) and θ (ω) is? Explanation: In general, H(jω) is a complex quantity, thus H(jω) = |H(jω)|ejθ(ω) where |H(jω)| is the magnitude and the phase angle is θ(ω) of the transfer function vary with frequency ω. 9. The value of k1 in the question 6 considering θ (ω) is? Explanation: The expression of k1 becomes K1 = A/2|H(jω)|ej[θ (ω)+Ø]. We obtain the steady state solution for y(t) by taking the inverse transform ignoring the terms generated by the poles of H(s). 10. The final steady state solution for y (t) in the question 4 is? a) A|H(jω) |cos⁡[ωt+Ø+ θ (ω)]. b) A|H(jω) |cos⁡[ωt-Ø+ θ (ω)]. c) A|H(jω) |cos⁡[ωt-Ø- θ (ω)]. d) A|H(jω) |cos⁡[ωt+Ø- θ (ω)]. Explanation: We obtain the steady state solution for y (t) by taking the inverse transform of Y(s) ignoring the terms generated by the poles of H (s). Thus yss(t) = A|H(jω)|cos⁡[ωt+Ø+ θ (ω)] which indicates how to use the transfer function to find the steady state response of a circuit.